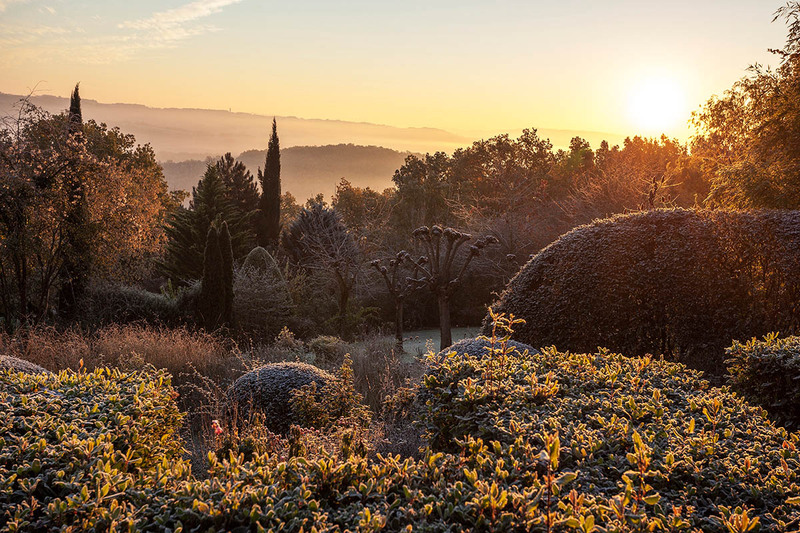 Amphitheatre and English garden in Les Jardins de Quercy on a frosty November morning at sunrise. The garden is situated just above the Aveyron valley with stunning views. The mist from the valley in combination with the light often turns it into a magical place. It was a crisp, very cold morning and the garden was glowing, trees and hedges shone as if hung with little diamonds. I loved the drama of the clipped hedges the amphitheatre is made of and the shapes of the trees and pruned shrubs. This is my favourite kind of light too! Due to the mild winter last year it was very difficult to shoot beautiful crisp winter scenes, so I was thrilled when - after a few visits - I finally managed to shoot this great garden on the perfect day.